UDM Downloads > WinX Free MP4 to MPEG Converter! 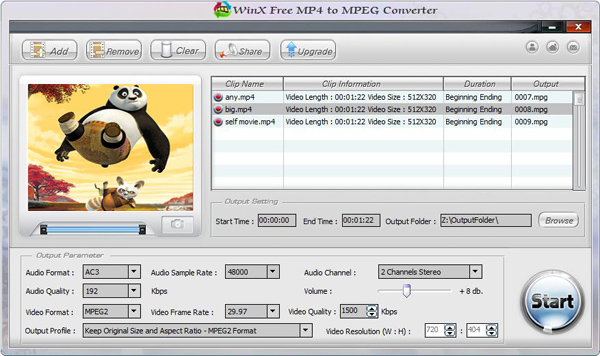 WinX Free MP4 to MPEG Video Converter is the best free MP4 to MPEG video converter. It helps you convert MP4 videos to MPEG format and playback on MPEG supported players/devices. With this free MP4 to MPEG converter, you're also permitted to capture images from original videos and to save as JPEG, BMP pictures. This free MP4 to MPEG converter software contains easy to use tools which enable the users to have videos converted from MP4 to MPEG format. It also ensures a perfect conversion performance as well as excellent output quality. Key Features: Clean and Free Video Converter: Steadily and freely convert MP4 to MPEG video files for smoothly playback on MPEG players and devices. Extract video scenes out and save as JPEG, BMP pictures. You can make these pictures wallpaper at will. 100% clean and free without spyware, malware, adware or virus. Rich Editing Features: Audio Format, Audio Sample Rate, Audio Channel, and Audio Quality are all adjustable . Self define Video Format, Video Frame Rate, Video Resolution, Video Quality. Also, this free MP4 to MPEG converter preloaded several preconfigured profiles to be chosen from which will make your conversion easier. You can convert the whole MP4 videos to MPEG format or convert your beloved parts by setting the Start Time and End Time. Easy Fast and High Quality: This free MP4 to MPEG converter offers one-click solution in free MP4 to MPEG converting with straightforward interface. Support both single and batch mode. It brings x5 faster MP4 to MPEG converting speed. Utilized high quality video encoding engine, this free MP4 to MPEG converter assures you excellent image/sound quality. No quality loss or degradation.